I find stranded colorwork fascinating, and wanted to give a pair of stranded mittens a little twist with an asymmetrical, unconventional design. I used two colors for this, but the design is suitable for variegated and semisolid yarns as well (especially for the background). 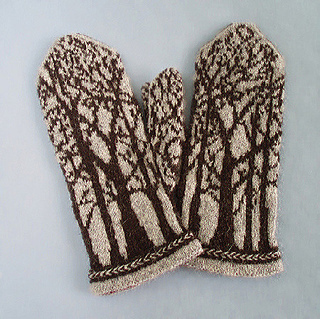 This design features an optional double-thick cuff, a decorative braided edging and asymmetrical stranded knitting. 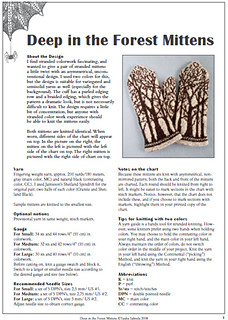 Both sides of mittens are shown in pictures. 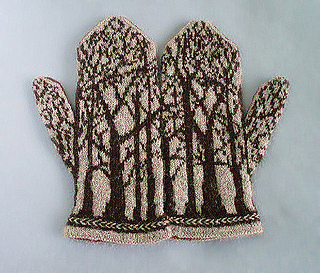 The tree pattern covers both the top and back of hand of mitten. 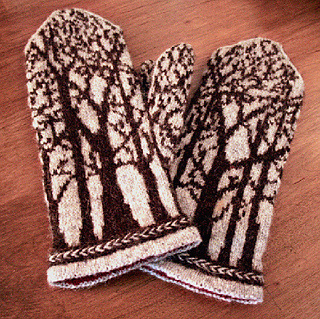 Because of the asymmetrical design, if you make a mistake (especially in the top half of mitten), no one will know! Last pattern update: October 7, 2016.